The 65 remaining players are on their last break of the night. The tournament staff are coloring up and racing off the 100 chips during this break. When the players return, they will play one more level before bagging up their chips for the night. Day 2 will resume at 12pm and will play down until an eventual winner. At 800/1,600 blinds, James Woods moved all in from middle position for his last 11,700. The button reraised to 25,000 and the blinds got out of the way. James was behind with king ten against the button's ace jack. The [2h][6d][7s][5d][Qh] board was no help to James, and he will be eliminated. A player was all in and at risk holding [As][Kd] against James Woods's [9s][9c]. Before the flop came out, a cocktail waitress asked James if he wanted a drink, to which he replied, "I may, hold on." 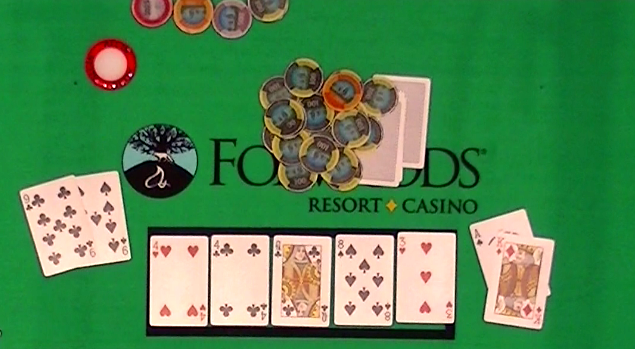 The [4h][4c][Qc] flop was good for James, as was the [8s] turn. When the [3h] hit the river, James told his opponent good game and promptly ordered a beverage. James now sits on approximately 34,000. The 157 remaining players are back from dinner break, and cards are back in the air. We are now streaming a featured table at www.FoxwoodsLive.com with Dave Stefanski in the 3 seat and actor James Woods in the 5 seat. It's 4:30pm in the Foxwoods Poker Room, and Event #1 is mid way through level 8. With registation still open, there are over 400 entries and roughly 250 players remain. Still in the field are James Woods, David Stefanski, Je Wook Oh, and Tesfay Begazyon, among others. After this level there will be a 10 minute break, and the field will play 2 more 40 minute levels before going on their 1 hour dinner break. Today is the first day of the 2014 World Poker Finals, and cards are in the air for Event #1 $600 NLH. This event features a $150,000 Guaranteed Prize Pool, and features 20,000 in starting chips and 40 minute levels on Day 1. Re-entries are available through the 8th level, or approximately 5:00pm EST. The full structure sheet is available here.